With the constant and well-organized distribution network, we manufacture and export an ample range of Electronic Plastic Component Moulds. 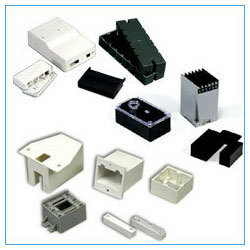 These are innovatively designed with accurate space to fit the electronic equipments perfectly. We manufacture these products using pure and thick plastics that are in the adherence with global standards. People prefer our product for easy working facility and durability. All these components are shock proof and light weight. Backed by more than two decades of experience, we are an ISO 9001:2008 certified company and providing our clients a wide assortment of Aluminum Casting, Gravity Die Casting, Plastic Die Moulds and components, Precision Machined Components and Turned Parts, Jigs and Fixtures, Zinc Casting and Pressure Die Casting Dies. Our extensive assortment is made using fine grade raw materials procured from the trusted vendors in the market. We design and manufacture our entire products strictly as per the client’s requirements. Furthermore, these products are tested on well defined parameters to conform the international quality standards. We offer our broad range on the competitive price that has helped us in expanding our business in the market. Our comprehensive range is appreciated by the various clients for the features like leak proof design, corrosion resistant finish, dimension accuracy, flexible body and high tensile strength.